Magic 2014 - Duels of the Planeswalkers's big breakthrough was adding the Sealed format, which finally allowed players to build their own decks from scratch. It wasn't universally praised, but I thought it was just what the franchise needed. 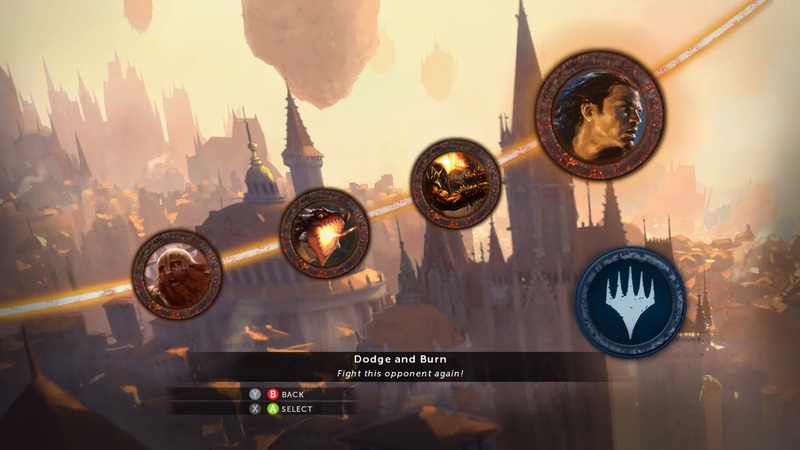 In the ongoing Duels tradition, we'll be seeing an expansion pack drop soon, which is offering up five new playable decks, five new challenges, and a new mini-campaign driving the updated story. I solved one of the new challenges without too much fuss, but the next one I tried was quite a doozy. If you're a fan of the challenge mode, you'll have your work cut out for you with the expansion, as the one that stumped me was brutally difficult, requiring you to deal 65 damage to an enemy with Hexproof in a single turn. The new decks on offer with the expansion include Nissa Revane's Elf tribal deck, which features a ton of your favorite Elves from Magic's history. It's mono-green, as you might expect, which makes the mana significantly better than some of the other decks. There's a Bant (Blue, White, Green) Exalted deck, featuring a number of cards from the Alara block, where Exalted was first introduced, as well as a couple of the more recent Exalted creatures. It even sports a Rafiq of the Many, which is one of my all-time favorite exalted stars. There's a mono-black Demon deck, offering tons of removal and huge demonic creatures to bash your opponent with. A Red and Blue counter-burn deck of sorts, which utilizes creatures that get bigger when you cast a spell. Take out their blocker with a Searing Spear, then attack with your newly buffed squad. Finally, there's the Boros (Red White) Samurai deck, featuring the Bushido ability. This looks like a ton of fun to play, especially if you missed the heyday of Bushido. 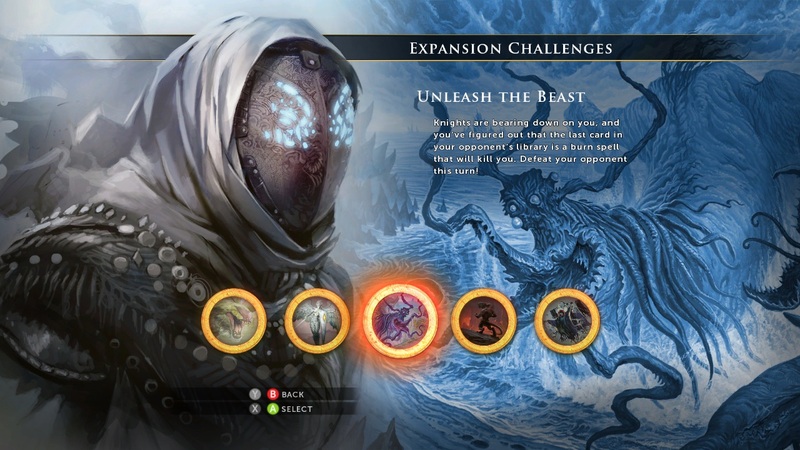 If you're like me, you'll probably want to play through the expansion campaign a few times to unlock the most powerful cards in whatever deck you decide to play. To that end, they've added three new planes for you to duel on, although it is in keeping with the scenario approach, rather than random deck approach, for all but the boss of each plane. The storyline continues with you searching for spell components, although the ultimate goal wasn't made clear. As you travel through the new planes, you'll be treated to the same kind of light story that was present throughout the core game. It's not much, to be fair, but the story does add an element of enjoyment that was lacking in the previous Duels iterations. 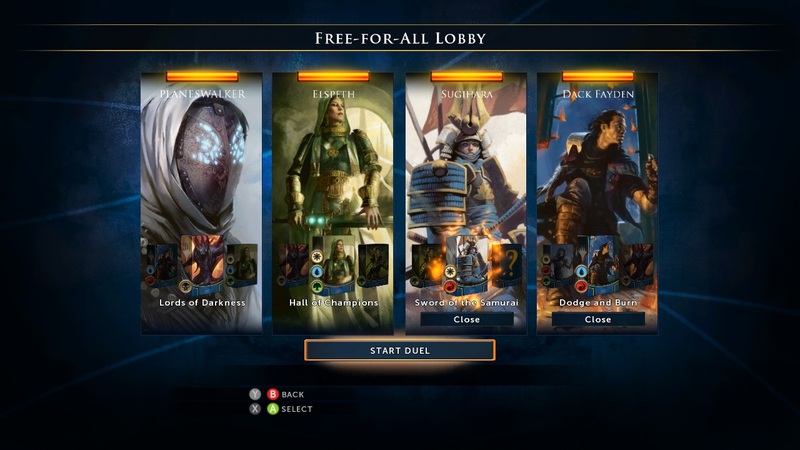 The Duels 2014 expansion is definitely worth your time if you're a challenge junkie or prefer to play with pre-built decks. 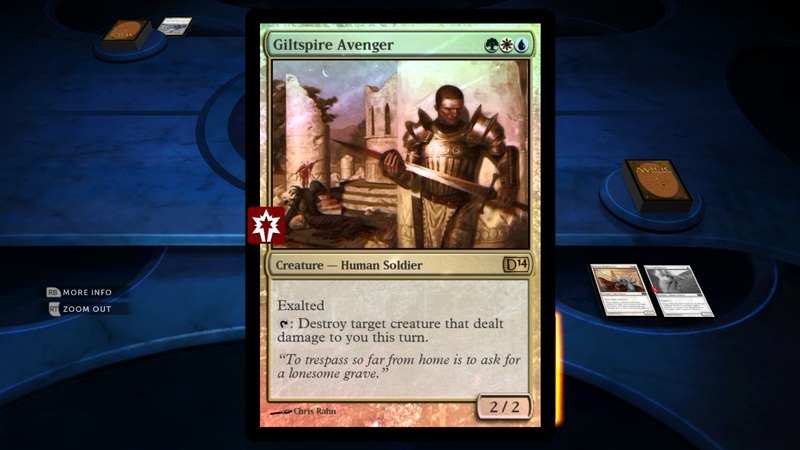 The expansion doesn't have much to offer deck builders, however, so if you're into Sealed above all, then you can probably give it a miss. 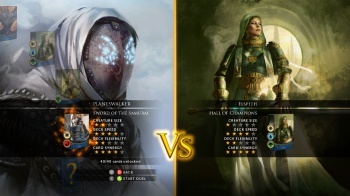 The Magic 2014 - Duels of the Planeswalkers expansion pack hits September 18th for practically every platform imaginable.